Modern and elegant, asymmetric and striking, Dior Tribales earrings revisit the pearl, an item associated with Mitzah Bricard, muse to Christian Dior, and recall in stylized form the little bells of the lily-of-the-valley, the couturier’s good-luck flower. Dior Tribales come in multiple lacquered, metalized or crystal-embellished versions, to be worn singly or as a duo, creating the possibility of endless combinations. The process of retracing their conception begins in the House’s design studio at 30 Avenue Montaigne in Paris, where the earrings’ gently rounded form is marked out for the first time on a blank sheet of paper. Its sketched curves are interpreted by the development team which produce a technical drawing detailing each element of the jewel. The next step finds us in Pforzheim, Germany, where a modeler, employing a CAD (computer-aided design) program, uses these indications to create the dimensions of the molds for the earring which will first be produced in wax. 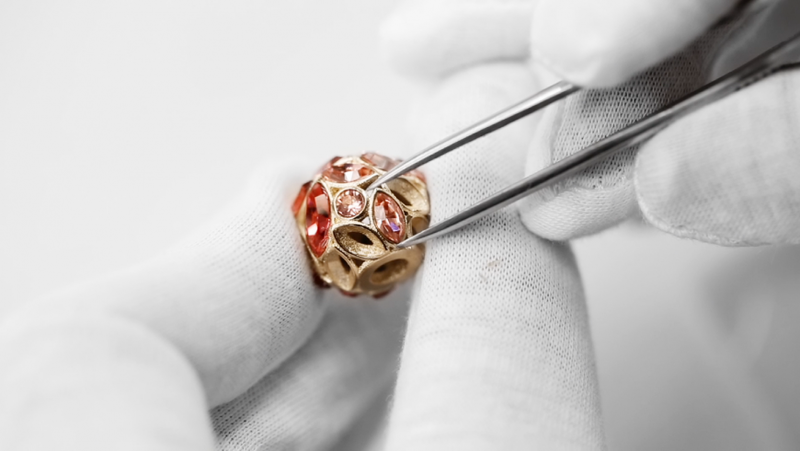 Dior Tribales Flowers, the version with petal-like crystals, takes form following the age-old lost wax technique which consists of replacing the models initially realized in wax with models in metal, the jewel’s definitive material. 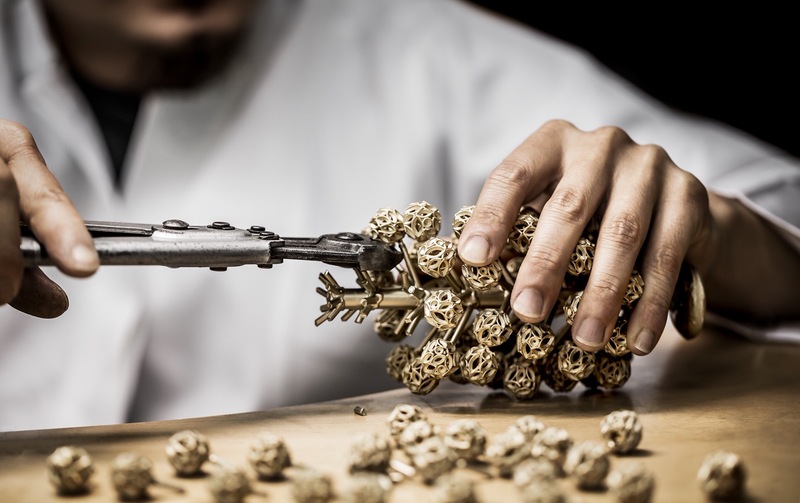 This is then carefully reworked by hand by the artisan, who refines the tiniest of details. He buffs and polishes the entire surface to render it as smooth as possible. Then, he secures the earrings onto a special vertical support and dips them into a galvanization bath to color the metal by depositing a micron of yellow or rose gold or palladium on its surface. This technique allows for the fixing of color in a way that ensures it maintains its intensity and brilliance over the years. A couture signature, “Dior” is delicately engraved by laser on each piece. 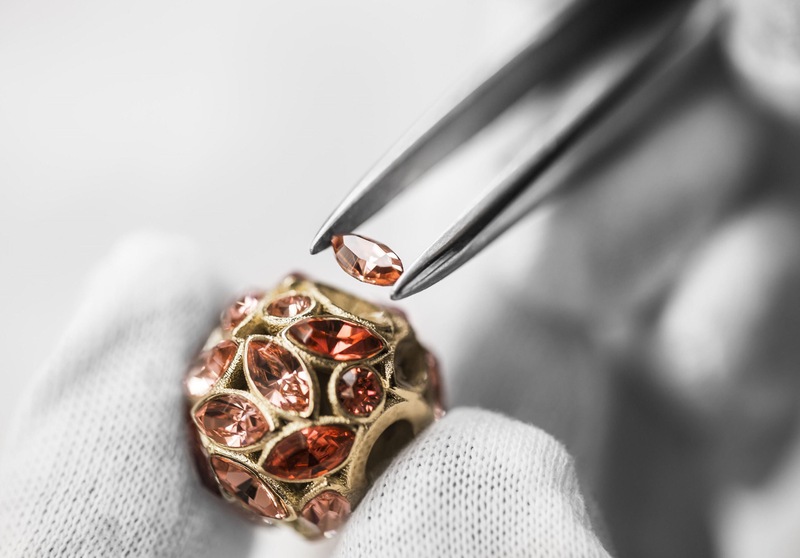 Next, for the Dior Tribales Flower the artisan selects then affixes the crystals of four sizes and two colors in their allotted places. And with their two asymmetric pearls assembled, the earrings are ready to proceed to quality control before being placed in their box.